Home djokovic federer grand slam murray nadal tennis Djokovic: Next Federer or Wilander? In 2011, Novak Djokovic was undoubtedly the best player on the planet. 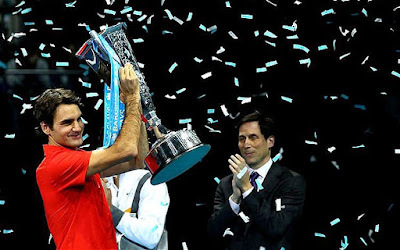 Ten titles, including three Grand Slam titles and five Masters 1000 titles, as well as a 70-6 record, placed him well ahead of all his nearest competitors. He became only the fifth player to win three Grand Slams in a year, joining the illustrious group of Roger Federer, Rafa Nadal, Jimmy Connors and Mats Wilander. His 41-match winning record fell one short of John McEnroe’s record. However, the question remains of how he will perform in 2012. Of those players who won three Grand Slams in a year, neither Connors nor Wilander won a Grand Slam the following year, while Nadal was only able to muster a single Slam. Indeed, Wilander would never reach a final again. Before this year, Djokovic was entrenched at number 3 in the world with a single Grand Slam title to his name. The real springboard for him was leading Serbia to victory in the Davis Cup in late 2010. Circumstances certainly helped him in the first Grand Slam of the year. The injury problems that plagued the 2009 champion, Rafa Nadal, ruled out one challenger, while he would certainly have been happier playing Andy Murray in the final than Roger Federer. However, we can take nothing away from the Serb, who was a worthy champion. From this point, his confidence was sky-high and, for a long spell, he was unbeatable. The problems came once injuries and fatigue began to take their toll, and it remains to be seen whether he will come back at the incredibly high level that he found for much of 2011. The later part of the season saw a few disturbing problems returning for the Serb. The shots that he had worked hard to improve during the year began to show some of their previous inconsistency. The serve in particular, which had improved measurably during 2011, began to show major signs of weakness, particularly in London. Rafa Nadal will have spent the winter studying and planning how to defeat Djokovic as well. Boosted by a stunning Davis Cup win, just as Djokovic was at the end of 2010, Nadal will be back better than ever in 2012. 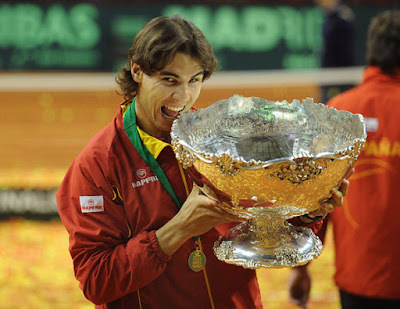 Despite claims of a disappointing season, Nadal reached three Grand Slam finals, five Masters finals, winning one, and picked up one additional title in Barcelona. Six of his seven losing finals came at the hands of the Serb, and by the end of the year, you got the impression that Nadal felt he could not touch Djokovic. One month off, you suspect Nadal will come back with renewed confidence and desire. Roger Federer also hinted in the latter part of the year that he was still a contender. The first player to beat Djokovic this season in Roland Garros, he should also have beaten him at the US Open, when he had two match points on his serve for a place in the final. However, following that disappointment, Federer did not lose again in 2011, racking up 17 straight victories, dropping only six sets, as his rivals faded. His run has raised suspicions that those writing him off could be premature, and he goes into the Australian Open as a real contender for the title. The one major question mark over Federer is his desire and motivation for the game. He has already said that his major goal for 2012 is Olympic gold, the one accolade that is missing from his record-breaking career. However, on his day, he is still capable of beating any player, including an on-form Djokovic. Andy Murray remains a mystery. He reached the final four of all four Grand Slams, including the final in Australia, but still that first Grand Slam title eludes him. He shows glimpses of the talent that he undoubtedly possesses – his back-to-back titles in Bangkok, Tokyo and Shanghai was evidence of that, especially his demolition of Nadal in Japan – but he still struggles to produce on the big occasions. Novak Djokovic will not have another season as good as this I would predict. Nadal will be back with a vengeance, buoyed by his Davis Cup triumph, and a new game-plan to beat his latest rival. Roger Federer will continue to be a danger on his day – he may not have the consistency that he had a few years ago, but his top level is still enough to beat any player on tour. Andy Murray and Juan Martin Del Potro will remain a real threat for any top player in any given tournament. Whether they have the consistency to win a slam next year remains to be seen, but they could easily take out one of the big three. It would be surprising if Djokovic followed in the footsteps of Connors and Wilander and failed to win a slam in 2012 – there is no real weakness in his style of play for opponents to exploit as those two experienced. However, it would be just as surprising if he was able to emulate Federer’s 2007 season and repeat his three slams, or come close to Roger’s 81-4 season in 2005 or his 92-5 2006 season. He will rightly go into the Australian Open as the favourite with the bookmakers. I would be surprised though if he comes out as the winner at the end of the fortnight. However, if he can back-up his 2011 with a similar season in 2012, he will move up alongside the likes of Federer as a true long-term dominant champion.